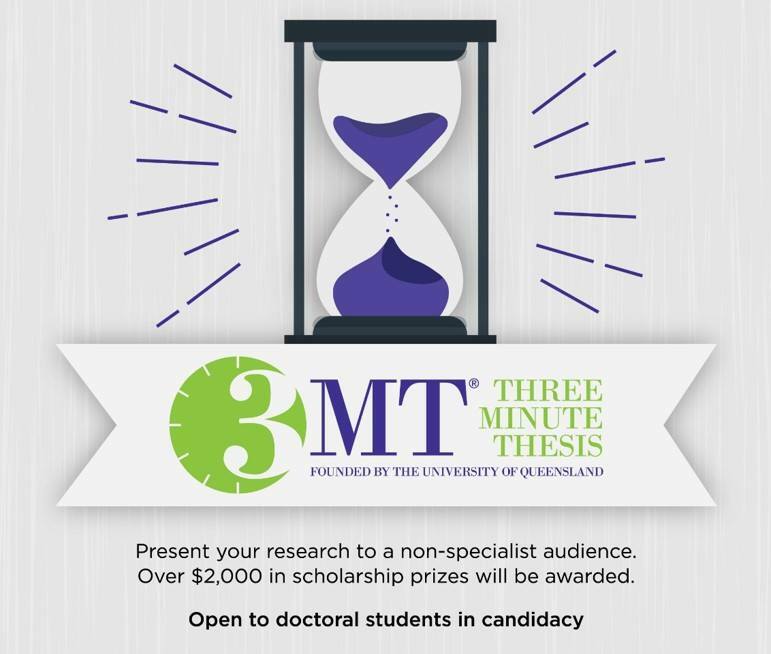 Doctoral students wanted for presenting in Three Minute Thesis (3MT) Competition. A Thesis in Three Minutes? An 80,000 word dissertation would take nine hours to present. Can you do it in just three minutes? If you think you have what it takes, join us for UCF’s first ever Three Minute Thesis (3MT) competition on Wednesday, March 27, 2019. Submissions for the event are now being accepted and will close on February 20. Participants must be currently enrolled UCF doctoral students who have entered candidacy and are actively engaged in dissertation research. Not sure if you’re ready? Join us for a Three Minute Thesis Information Session and Pitch Workshop on February 14 at 3:00 p.m. Hosted by the College of Graduate Studies and Blackstone LaunchPad, UCF’s 3MT event will cultivate students’ academic, presentation, and research communication skills. Doctoral students will communicate their research in just three short minutes and with only one PowerPoint slide to judges while competing to win monetary prizes. Developed by The University of Queensland (UQ) in 2008, enthusiasm for the 3MT concept has developed rapidly and 3MT competitions are now held in over 600 universities and institutions across 65 countries worldwide. For more information, visit the 3MT website at or contact us at gradworkshops@ucf.edu or 407-823-2766.